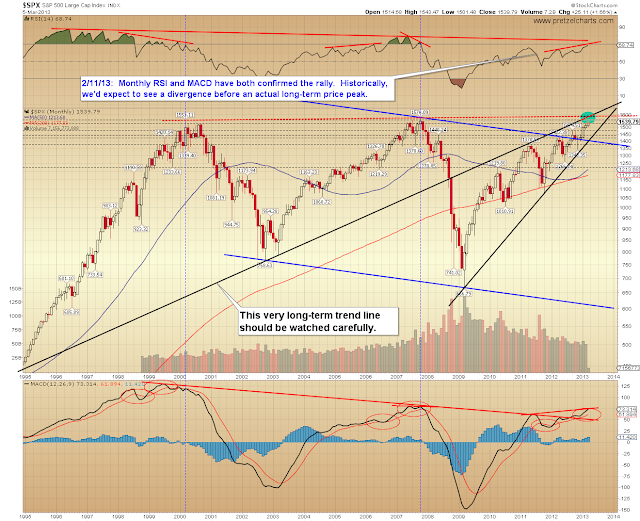 Pretzel Logic's Market Charts and Analysis: 1540 Target Reached, Can Bulls Keep Pushing? 1540 Target Reached, Can Bulls Keep Pushing? In Monday's update, both the preferred outlook and the first alternate count projected that the S&P 500 (SPX) would rally to 1540 +/-, which happened with blinding speed on Tuesday. 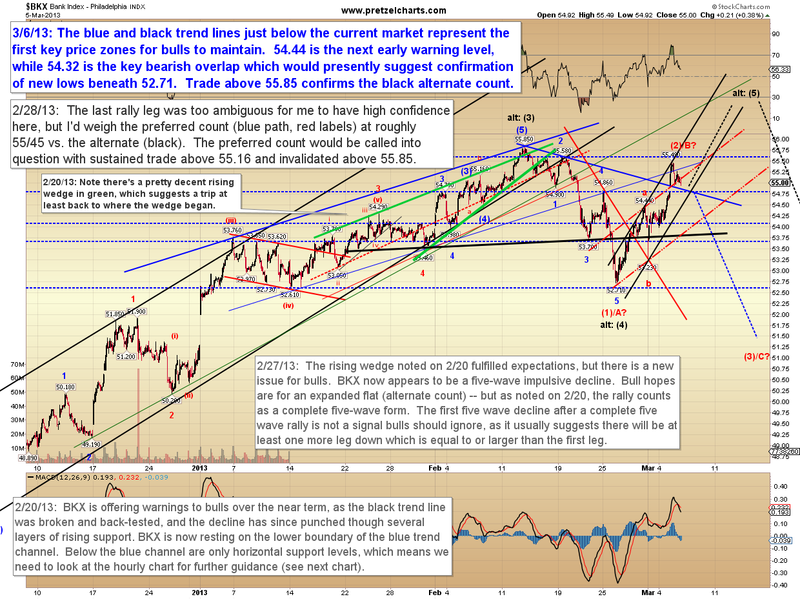 The main bull and bear outlooks from Monday remain materially unchanged, though of course with the added information provided by the price movement since then, I have been able to refine some of the key levels. 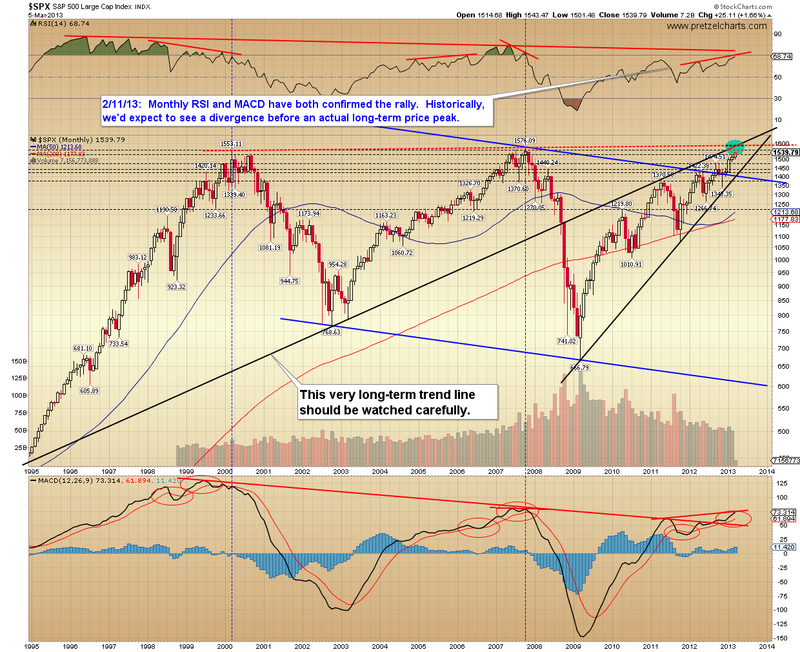 Before we get into the near-term outlook, let's center ourselves with the long-term. As I've mentioned several times before (and as most every other technician on the planet has no doubt noticed), the market is in a very long-term resistance zone. Of note, the Dow Jones Industrial Average (INDU, not shown), did make a new all-time high yesterday (and in the process finally reached my 14,200+ target zone from January 24). I always find it interesting when wave counts target potentially important confluence zones (almost as if the market knew exactly where it was headed from the beginning of the move), and in this case, the more bullish interpretation of the wave structure (below) seems to be pointing right at the blue confluence highlighted on the monthly chart above. 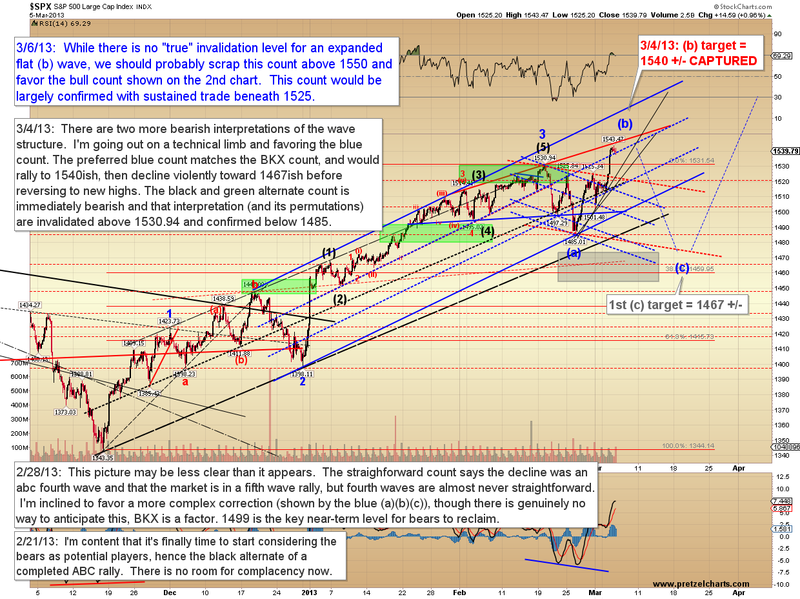 The wave count below suggests a fifth wave rally is now pushing into this long-term resistance zone, to be followed by a sizeable correction (typically about 50% of the preceding rally). 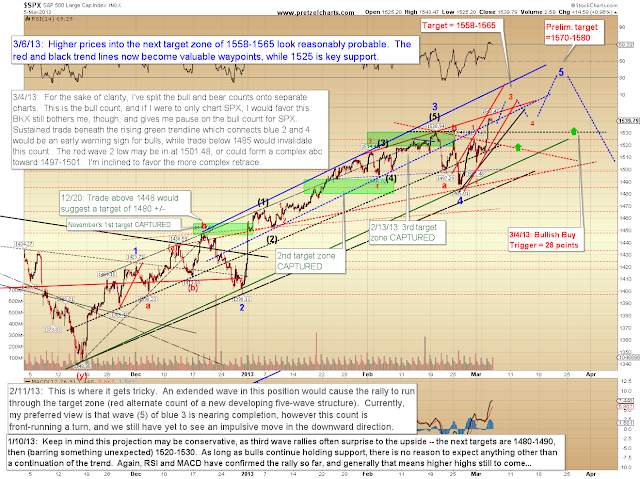 On Monday, the preferred and first alternate count were both in agreement on higher prices to the 1540 zone, but now we reach an inflection point where they begin to diverge. The expanded flat, shown below, is hard to invalidate, but we should probably scrap that count above 1550 and favor the more bullish option at that point. In the previous update, I was quite tempted to favor the more immediately bullish interpretation shown above, and I'm now even more tempted to do so -- but we'll wait and see how this plays out with the 1550 zone. If nothing else, we should have an answer fairly soon. 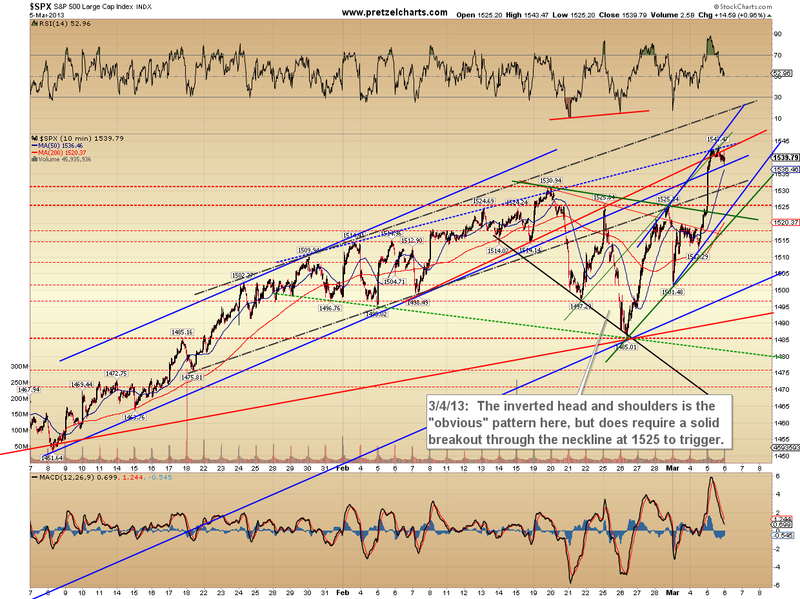 Do note that this count is only bearish for a short time, but ultimately suggestive of higher prices to follow. 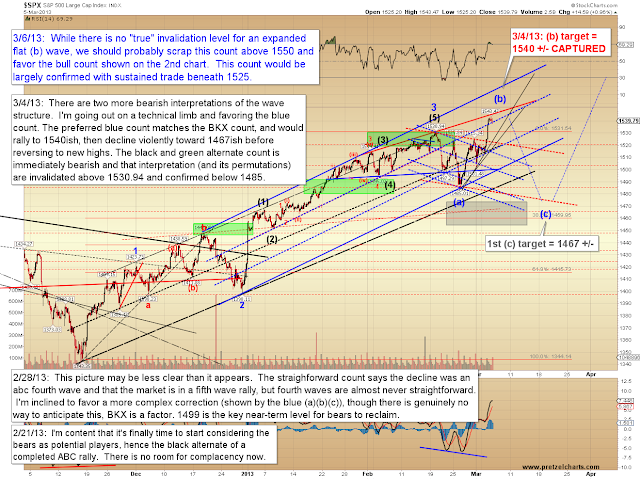 In conclusion, there is a slight irony in the present charts, in that the bull outlook, if realized, actually suggests bears would follow with a longer period of corrective activity than they would with the more immediately bearish count. In either case, the intermediate trend presently remains up. It will be interesting to see if bears can put together a stand around 1550 over the near-term, or if they're simply going to head into hibernation for the moment and look to strike again at higher prices. If 1550 is claimed, we know which price levels to watch next. Trade safe.